Amazon recently announced AWS Solutions, a central catalog of well-designed, well-documented, CloudFormation templates that solve common problems, or create standard solution frameworks. My tweet about this announcement garnered more interest than I expected. One common request was to have a way to be alerted when Amazon publishes new AWS Solutions to this catalog. Kira Hammond (yes relation) has used AWS to built and launched a public service that fills this need. Kira’s “AWS Solutions Update Feed” monitors the AWS Solutions catalog and posts a message to an SNS topic whenever new solutions are added. The SNS topic is public, so anybody in the world can subscribe to receive these alerts through email, AWS Lambda, or SQS. 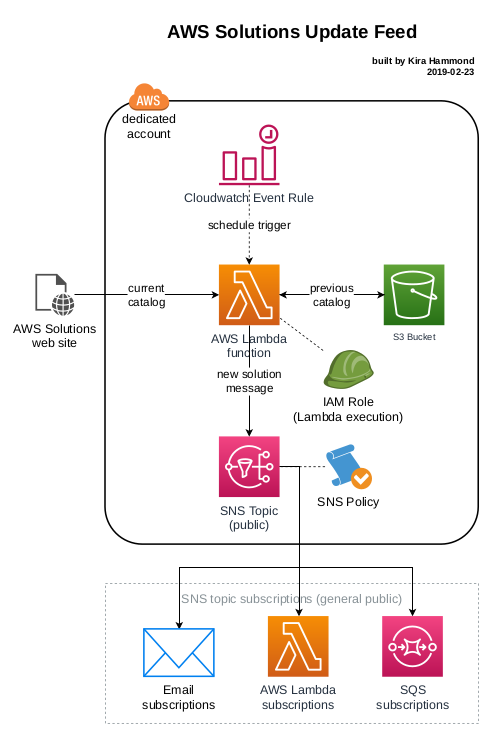 A scheduled trigger from a CloudWatch Event Rule runs an AWS Lambda function every N hours. The AWS Lambda function, written in Python, makes an HTTPS request to the AWS Solutions catalog to download the current list of solutions. The function retrieves the last known list of solutions from an S3 bucket. The function compares the previous list with the current list, generating a list of any new AWS Solutions. If there are any new solutions, a message is posted to a public SNS topic, sending the message to all subscribers. The current list of solutions is saved to S3 for comparison in the future runs. You can run an instance like you normally do for on-demand instances and add one option to make it a Spot instance! The instance starts up immediately if your bid price is sufficient given spot market conditions, and will generally cost much less than on-demand. Spot price volatility has been significantly reduced. Spot prices are now based on long-term trends in supply and demand instead of hour-to-hour bidding wars. This means that instances are much less likely to be interrupted because of short-term spikes in Spot prices, leading to much longer running instances on average. You no longer have to specify a bid price. The Spot Request will default to the instance type’s on-demand price in that region. This saves looking up pricing information and is a reasonable default if you are using Spot to save money over on-demand. CloudWatch Events can now send a two-minute warning before a Spot instance is interrupted, through email, text, AWS Lambda, and more. Putting these all together makes it easy to take instances you formerly ran on-demand and add an option to turn them into new Spot instances. They are much less likely to be interrupted than with the old spot market, and you can save a little to a lot in hourly costs, depending on the instance type, region, and availability zone. Plus, you can get a warning a couple minutes before the instance is interrupted, giving you a chance to save work or launch an alternative. This warning could be handled by code (e.g., AWS Lambda) but this article is going to show how to get the warning by email and by SMS text message to your phone. You should not run a Spot instance unless you can withstand having the instance stopped for a while from time to time. Make sure you can easily start a replacement instance if the Spot instance is stopped or terminated. This probably includes regularly storing important data outside of the Spot instance (e.g., S3). You cannot currently re-start a stopped or hibernated Spot instance manually, though the Spot market may re-start it automatically if you configured it with interruption behavior “stop” (or “hibernate”) and if the Spot price comes back down below your max bid. If you can live with these conditions and risks, then perhaps give this approach a try. The option parameters we will use do not specify a max bid, so it defaults to the on-demand price for the instance type in the region. We specify “stop” and “persistent” so that the instance will be restarted automatically if it is interrupted temporarily by a rising Spot market price that then comes back down. Adjust the following options to suite. The important part for this example is the instance market options. instance_name="Temporary Demo $(date +'%Y-%m-%d %H:%M')"
If there is capacity, the instance will launch immediately and be available quickly. It can be used like any other instance that is launched outside of the Spot market. However, this instance has the risk of being stopped, so make sure you are prepared for this. The next section presents a way to get the early warning before the instance is interrupted. I run some SNS topics as a public service where anybody can subscribe their own AWS Lambda functions, SQS queues, and email addresses. If one of these SNS topics were to be accidentally deleted, I could recreate it with the same name and ARN. However, all of the existing user subscriptions would be lost and I would not be able to restore them myself. Each of the hundreds of users would have to figure out what happened and re-subscribe the appropriate targets with the correct permissions. I don’t want these SNS topics to be deleted. Ever. It took a while, but the Unreliable Town Clock finally lived up to its name. Surprisingly, the fault was not mine, but Amazon’s. Last week I announced the availability of a public SNS Topic that may be used to run AWS Lambda functions on a recurring schedule. To encourage folks to realize the implications of a free community service maintained by an individual, I named it the “Unreliable Town Clock”. Even with this understanding, some folks in the AWS community have (again) placed their faith in me and are already starting to depend on the Unreliable Town Clock public SNS Topic to drive their own AWS Lambda functions and SQS queues, and I want to make sure this service is as reliable as I can reasonably make it. Update 2015-10-08: Amazon has released AWS Lambda Scheduled Functions. I recommend using that feature to schedule AWS Lambda functions. In fact, the Unreliable Town Clock switched to use this feature behind the scenes, the day it was announced. Scheduled executions of AWS Lambda functions on an hourly/daily/etc basis is a frequently requested feature, ever since the day Amazon introduced the service at AWS re:Invent 2014. Until Amazon releases a reliable, premium cron feature for AWS Lambda, I’m offering a community-built alternative which may be useful for some non-critical applications. Beyond its event-driven convenience, the primary attraction of AWS Lambda is eliminating the need to maintain infrastructure to run and scale code. The AWS Lambda function code is simply uploaded to AWS and Amazon takes care of providing systems to run on, keeping it available, scaling to meet demand, recovering from infrastructure failures, monitoring, logging, and more. The available methods to trigger AWS Lambda functions already include some powerful and convenient events like S3 object creation, DynamoDB changes, Kinesis stream processing, and my favorite: the all-purpose SNS Topic subscription. Even so, there is a glaring need for code that wants to run at regular intervals: time-triggered, recurring, scheduled event support for AWS Lambda. Attempts to to do this yourself generally ends up with having to maintain your own supporting infrastructure, when your original goal was to eliminate the infrastructure worries. The Unreliable Town Clock (UTC) is a new, free, public SNS Topic (Amazon Simple Notification Service) that broadcasts a “chime” message every quarter hour to all subscribers. It can send the chimes to AWS Lambda functions, SQS queues, and email addresses. The aws-cli documentation and command line help text have not been updated yet to include the syntax for subscribing an AWS Lambda function to an SNS topic, but it does work! where REGION, ACCOUNT, SNSTOPIC, and LAMBDAFUNCTION are substituted with appropriate values for your account. A fantastic new and oft-requested AWS feature was released during AWS re:Invent, but has gotten lost in all the hype about AWS Lambda functions being triggered when objects are added to S3 buckets. AWS Lambda is currently in limited Preview mode and you have to request access, but this related feature is already available and ready to use. I’m talking about automatic S3 bucket notifications to SNS topics and SQS queues when new S3 objects are added. Unlike AWS Lambda, with S3 bucket notifications you do need to maintain the infrastructure to run your code, but you’re already running EC2 instances for application servers and job processing, so this will fit right in. To detect and respond to S3 object creation in the past, you needed to either have every process that uploaded to S3 subsequently trigger your back end code in some way, or you needed to poll the S3 bucket to see if new objects had been added. The former adds code complexity and tight coupling dependencies. The latter can be costly in performance and latency, especially as the number of objects in the bucket grows. With the new S3 bucket notification configuration options, the addition of an object to a bucket can send a message to an SNS topic or to an SQS queue, triggering your code quickly and effortlessly. Here’s a working example of how to set up and use S3 bucket notification configurations to send messages to SNS on object creation and update. The Amazon documentation describes how to use the AWS console to monitor your estimated charges using Amazon CloudWatch and includes some pointers for folks using the command line. Unfortunately, that article leaves out the commands to set up the SNS (Simple Notification Service) topics and SNS subscriptions, so I present here the complete steps I use. I like using the command line tools as they let me automate and repeat actions without having to do lots of pointing, clicking, and re-entering data. For example, I want to set up a number of billing alerts in each new account, sometimes at $10 increments, and sometimes at $100 or $1000 increments. The steps below let me do this in seconds with a simple copy and paste.